It is very strange to see such a euphoric stock market rally and not have the semiconductor index participate. Every talking head in the financial media is raving over the better than expected job report. They are all raving about the Dow Jones Industrial Average making a new 52 week high this morning. While the rally looks good we must ask ourselves what is going on in the semiconductor index. This morning the Semiconductor Holders Trust (NYSE:SMH) is trading lower by 0.15 cents to $34.44 a share. The SMH is also still trading below it’s daily chart 50 moving average which is at $34.93. When a stock or ETF trades below it’s daily chart 50 moving average this is usually a sign of weakness and must be watched closely. 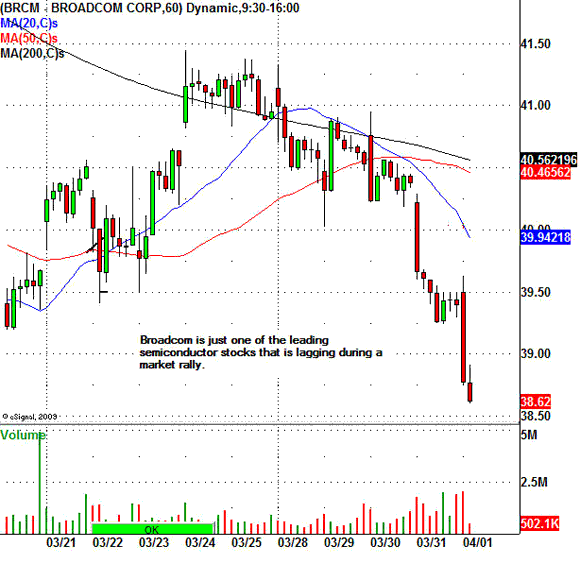 Other leading semiconductor stocks that are trading lower this morning are Intel Corp. (NASDAQ:INTC), and Broadcom Corp. (NASDAQ:BRCM). These two semiconductor giants are also major components of the S&P 500 Index and the NASDAQ 100 Index. Intel is actually also a component of the Dow Jones Industrial Average.